Lose 8-12+ pounds in 28 Days by joining our New Fat Flush Bootcamp Challenge #4 and start to transform your body for a lifetime. You can now lock in your spot right now. This training program is fast paced, strength and interval training style. Each participant is motivated in the outdoor and indoor environment to excel beyond current levels of fitness. It’s proven results that brings everything together AND allows each person to be challenged beyond their fitness level and creates faster RESULTS! And I know your want FAST RESULTS right? Sign up now (below) before you forget. Spots will fill up quickly! Our three classes will start at 5:45am (Bootcamp), 8:30am (BodyPump), and 7:00pm (Bootcamp). I must also tell you that you should sign up right away after reading this to guarantee your spot. The way it works is you do 3-5 high intensity boot camp, Body Pump and core style workouts per week for 28 days. Each 60 minute session includes a powerhouse of drills, relays, core training, agility training, resistance training, body weight work and dynamic team work exercises designed to surprise, motivate, inspire and push you to your limit. You will be kept motivated, focused on your goals AND in a state of empowered learning – All YOU have to do is sign-up (below) and play hard! By joining us for an invigorating 28 Day program you will lose weight quick, increase your daily energy, drop pounds, lose inches, build long lean muscles, decrease the middle bulge, trim your hips, shape your bottom, gain noticeable strength, endurance and overall stamina all while adding flexibility and grace to your everyday movement. And did I mention you will lose weight quick? You will see a firmer, shapelier, much livelier you in just 28 days! Now here’s the best part of this whole thing…the cost. Now since my previous programs SELL OUT so quickly and me wanting to help you, I decided to keep the price the same. But you have to join really soon before this session sells out quickly. 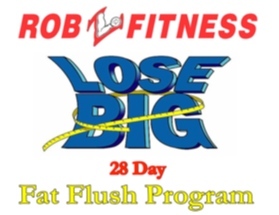 Like I said the program starts Monday, April 15th at 5:45am, 8:30am or 7:00pm at RobZFitness (new location). So if you want to burn lots of fat and improve muscle tone then you need to sign up (below) today to lock in your spot. If you have any other questions regarding the class please reply back by email to Rob@RobZFitness.com so that I can reply back to you quickly. Please tell your friends and invite them to take class with you. It’s always more fun working out with a buddy. Be sure to sign up below or reach out to me at (813) 571-3700 or at Rob@RobZFitness.com for more details.